JBL's Xtreme and Flip 3 portable wireless speakers were both leaked ahead of their official release by a European consumer electronics retailer. The company's Xtreme model looks to be the most rugged of them all featuring a resilient nylon fabric mesh similar to the UE Megaboom, which is described to be durst, mud and water-resistant. The Xtreme borrows some key features from JBL's Charge 2+ while enhancing them even further such as dual USB ports for charging external devices, a long-lasting 12 hour battery life, on-board speakerphone functionality with an echo & noise-canceling microphone – as well as two large side firing bass radiators that accompany what looks like four front-firing speaker drivers for a total of six drivers. That's two more drivers than what is currently found on the Charge 2+, so hopefully we should be able to hear the difference in sound quality. The new Xtreme features a huge 10,000mAh internal rechargeable battery for up to 15 hours of wireless playtime, and can also be paired up with multiple Xtreme speakers to play and stream audio at the same time using the JBL Connect app. From the looks of it, the Xtreme is JBL's largest portable wireless speaker designed with ruggedness and powerful audio performance in mind. The complete set of details including pricing and availability are still unknown, but we do know that the Xtreme will initially be available in red, blue and black. 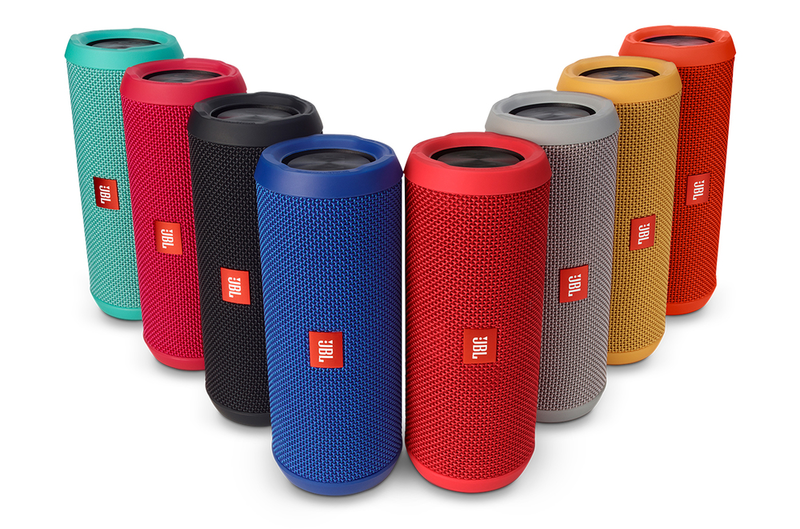 JBL's most popular and affordable portable Bluetooth speaker, the Flip, has received a major redesign with upgraded hardware with the third generation of the Flip 3 – which again boasts a design that has been heavily inspired by the Charge 2. The Flip 3 now has an 8-hour battery life, an improvement over the Flip 2's 5-hour battery life, as well as a new water-resistant fabric mesh and rubberized exterior construction rather than a perforated metal grille – which should help bolster its toughness outdoors compared to its predecessor the Flip 2. Other features include a detachable lanyard attachment and a built-in speakerphone with an echo & noise-canceling microphone. In addition to that, the Flip 3 features similar passive bass radiators at both ends, albeit slightly smaller than the Charge 2's, that should greatly improve the Flip's bass response while still having a smaller form factor compared to the Charge 2 and Charge 2+. And like the Charge 2 and Charge 2+ speakers, the Flip 3 can also be used in an upright or landscape orientation. Another new feature that's also available on the Xtreme speaker model is the ability to simultaneously connect multiple speakers to play and wirelessly stream audio using the JBL Connect app. 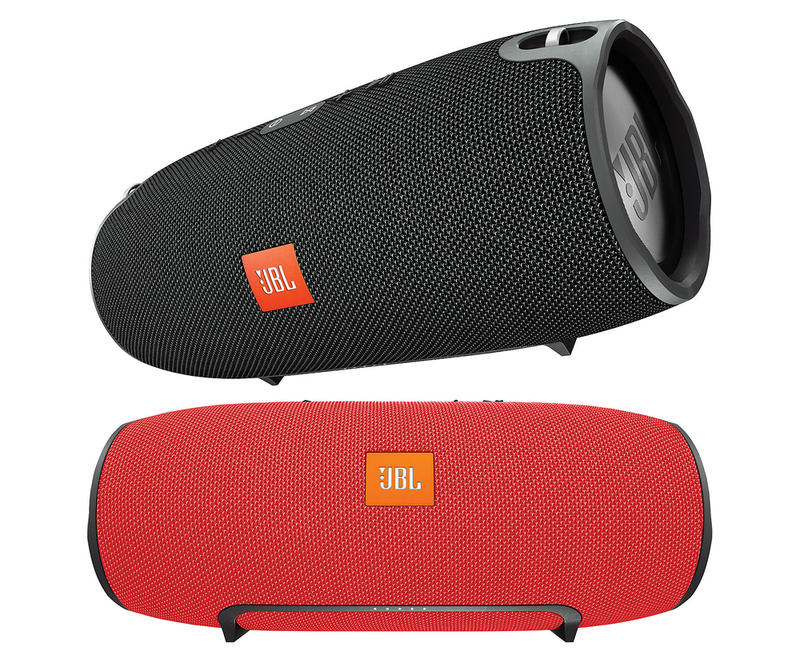 JBL claims that the Flip 3 has been engineered to also sound more powerful than its predecessor, but we still aren't sure about the full details of what has been changed or improved. What we do know is that the Flip 3 will be offered in a wide range of colors, 8 to be exact. Pricing and availability are still unknown, but if we'd had to guess, the Flip 3 will carry a $100 price tag just like its predecessor.